Business confidence is holding up and revised data shows Japan dodged a technical recession. Our index also suggests the economic picture may be improving. In October the gauge reached its highest point since 2000: prices, stocks, lending, wages and consumption all crept up. 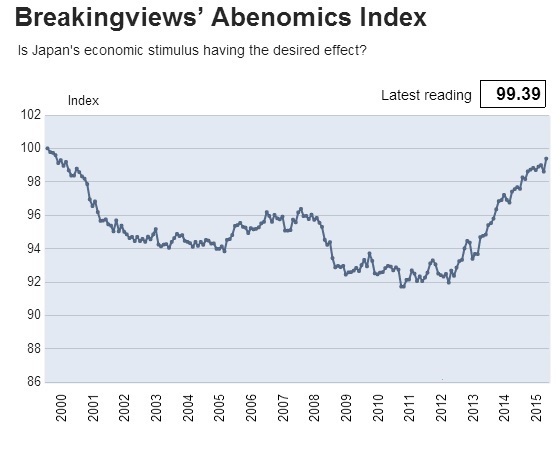 The Breakingviews Abenomics Index gave a reading of 99.4 in October, up from a revised 98.6 in September. Confidence at big Japanese manufacturers held steady in the three months to December, the Bank of Japan’s “tankan” survey showed on Dec. 14. The survey also found big firms plan to raise capital spending by 10.8 percent in the fiscal year that ends in March. That compares with their previous plans for a 10.9 percent increase and with economists’ median estimate of a 10.2 percent expansion. Revised GDP data for the third quarter revealed Japan’s economy did not suffer a technical recession, or two straight quarters of contraction, after all. The new data showed an annualized expansion of 1.0 percent, compared with a preliminary estimate of a 0.8 percent fall, Reuters reported on Dec. 8.